Steele, Allen. 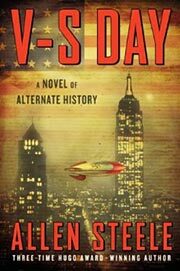 V-S Day: A Novel of Alternate History . Ace 2014. What if: Germany began development of the rocket-launched Silbervogel as the Amerika Bomber in 1941, and learning of the project, the US started a crash rocket development program headed by Robert Goddard. Series note: Series containing V-S Day (expanded from "Goddard's People"), "John Harper Wilson", and The Tranquillity Alternative . Summary: A history of Project Blue Horizon and its critical race to prevent a Nazi rocket-boosted aircraft from bombing New York. .
Series note: An Alternate Space novel. Published: Ace 2014 (0425259749w88 android, 0425259757BUY). Published: Expanded and revised from "Goddard's People", in Isaac Asimov's Science Fiction Magazine , July 1991; What Might Have Been? Volume 3: Alternate Wars (eds. Gregory Benford and Martin H. Greenberg), q.v. ; and Rude Astronauts: Real and Imagined Stories , Legend 1992 (0099260018), Old Earth 1993 (1882968018BUY), Ace 1995 (044100184XBUY). Published: "Goddard's People" revised from "Operation Blue Horizon", in Worcester Monthly , September 1988. 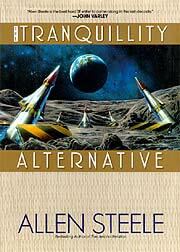 Awards: Finalist: 2014 Sidewise Award for best long-form alternate history. Steele, Allen. "John Harper Wilson"
Summary: In 1969, the US government plans to claim the moon, but the commander of the first manned landing goes in peace for all mankind. Series note: An Alternate Space story. Published: In Isaac Asimov's Science Fiction Magazine , June 1989; and Rude Astronauts: Real and Imagined Stories , Legend 1992 (0099260018), Old Earth 1993 (1882968018BUY), Ace 1995 (044100184XBUY). Steele, Allen. The Tranquillity Alternative . Ace 1996. Summary: In 1995, the U.S. is about to decommission its nuclear missiles at Tranquillity Base and sell the installation to the Germans, but saboteurs are at work. Published: Ace 1996 (0441002994BUY), 1997 (0441004334BUY). Translation: Italian by Roberto Marini as La fortezza sulla Luna , Mondadori 1996 (8804425350).